Best Season February- May, September -December. 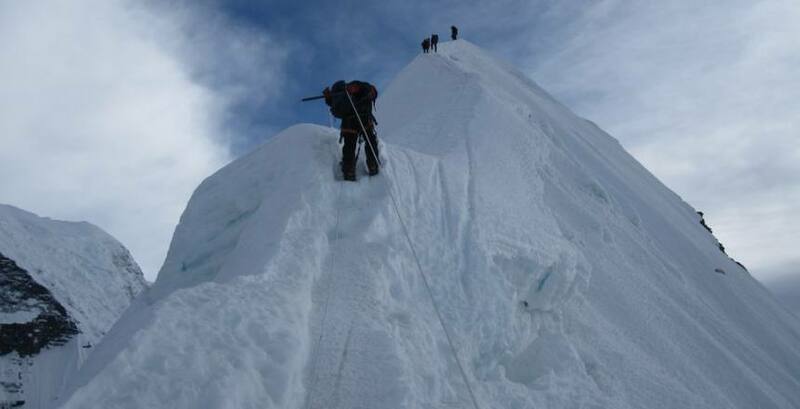 Island Peak Climbing with Kala Patthar Trek takes you in the heart of Everest region. Island peak (6173m.) also known as Imja Tse is the easiest and most popular trekking peak in Nepal which is situated close to the Mt. Everest. Island peak appears like an island in a sea of ice from Dingboche. Island peak climbing with Kala Pattar trek offers the combination of natural scenery, cultural experience and the excellent view of the mountains. From the Kala Pattar you can observe the unrivaled view of the Mt. Everest (8848m. ), the highest mountain of the world. From the Island peak you can observe and enjoy the amazing view of the White Mountains of Everest region like Nuptse (7,879m. ), Lhotse (8,501m. ), Lhotse Middle Peak (8,410m.) and Lhotse Shar (8,383m.) in the north, Makalu (8475m. ), Ama Dablam etc. The culture and lifestyle of the Sherpa people along with their warm greeting on the way adds further pleasure to the climbers. 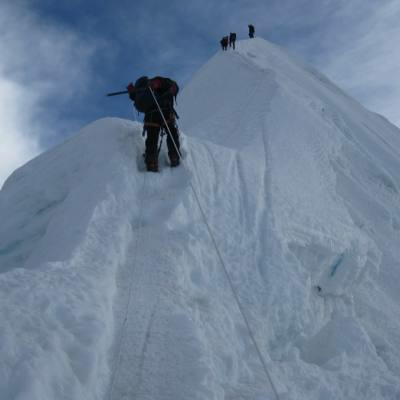 Island Peak Climbing with Kala Patthar Trek combines peak climbing with the Everest region trekking experience to the trekkers. While trekking to the base camp of the peak climbers take the pleasure with the natural scenery and cultural experience. The amazing journey of Island peak and Kala Pattar starts with the scenic flight to Lukla from Kathmandu. Then you start your trek and traverses through the river valleys, forest of rhododendron, world heritage Sagarmatha national park, and different Sherpa settlements enjoying the views of waterfalls, snow clad peaks and natural beauty. The route to climb the peak is the south east flank. While climbing you see the beautiful view of the Imja valley and Khumbu glacier. The best seasons to go for Island peak climbing are spring and autumn. Some highlights of this trek include Buddhist Monasteries, Alpine forests of fir and rhododendron, high suspension bridges, meeting caravans of yaks and yak-cow crossbreeds along the way. Namche Bazaar is a colorful, bustling market with traders from surrounding villages and as far as Tibet. From Tengboche Everest, Lhotse, Nuptse and Ama Dablam can all be seen. Climbing above the tree line to cross alpine pastures and glacial moraine you eventually reach Base Camp, high on the Khumbu Glacier, where colorful expedition tents give a bizarre appearance to this desolate place surrounded by rock, snow, and ice. Day 06: Trek to Tengboche Monastery (3860m.) 5 hours. Hotel in Kathmandu as your requirements. Any expense of personal nature Nepal entry Visa fee (USD $40 for 30 days and USD 25 for 15 days Visa, You will get a visa open your arrival. Although it can be customized by request to accommodate your specific needs. The above itinerary is only a guideline; it might change due to fluctuating weather conditions, availability of lodging and campsites, unforeseen political, trail and environmental or any other factors beyond our control. In this happen, your Nepal Everest Base Camp Trekking Company guide/leader will choose the best way to the final decision on the best alternative after consulting with the group. At last, if the itinerary will be not suitable for you please do let us know and will make a tailor-made on it. The itinerary will be very flexible from our side if clients want to change will be possible. Day 01Arrival in Kathmandu After you arrive in Tribhuvan international airport in Kathmandu you meet our representative. They transfer you to your hotel. Overnight at hotel. Day 02Kathmandu valley sightseeing This day you will go for sightseeing in the Kathmandu valley. In the morning after having breakfast you go visit Buddhist and Hindu temples Boudhanath, Pashupatinath, Swayambhunath, which reflect the local culture and tradition of Nepalese society. Then in the afternoon you visit Kathmandu Durbar square and Patan durbar square. In the evening you will return to the Hotel. Day 03Flight to Lukla and trek to Phakding (2700m.) In the morning you have a scenic flight to Lukla (2800m.) from Kathmandu. It takes 30-40 minutes to reach Lukla. Then you start your trek and head to Phakding. You descend steeply to the Tharo Koshi which is also known as Kusum Kangru Khola (river). After crossing the Tharo Kosi River through the suspension bridge, you climb to Ghat and continue climb to Phakding. In Phakding you can climb to the Gompa to see your first view of the high peaks. O/N at Phakding. Day 04Phakding to Namche Bazaar (3440m.) This day at first we follow the Dudh Koshi River and reaches Zamphuti. From here you can see excellent views of Thamserku peak. Then you ascend to Chomoa, the site of an agricultural project, an interesting place to have a look around and gain an insight into the farming way of life of these people. From Chomoa, we continue our walk uphill and enter the Sagarmatha (Everest) National Park (1148sq km, established in 1976) at Monjo (2840m.). We continue our walking up hill with mountain views and finally reach Namche Bazaar. Stay at Guest house- Lunch, Dinner and Breakfast. O/N at Namche Bazaar (3420m.). Day 05Rest in Namche (3440m.) today we take rest for the proper acclimatization with some excursion. We can hike to the Everest View Hotel, the ideal place to overview some of the outstanding mountains such as Mt. Everest, Ama Dablam, Thamserku, Lhotse etc. You can walk around the Khumjung valley, Hillary School and Khunde Hospital and then return back to Namche. In Namche Bazaar you can spend some time interacting with the fun-loving Sherpa and Rai people. Day 06Trek to Tengboche Monastery (3860m.) 5 hours. This day we leave Namche bazaar and walk for some time along the ridge and then descend to Dudh Koshi River at Phunkithanka. Then after crossing the bridge we ascend in the steep path up to the Tengboche. On reaching Tengboche you will see the local monastery. Tengboche have largest Monastery of Khumbu region. Overnight at guesthouse. Day 07Tengboche to Dingboche (4350m.) From Tengboche we descend down to Debouche, cross another exciting suspension bridge on the Imja Khola, and climbs to Pangboche amongst thousands of Mani stones. Our uphill trek continues, taking us to the quaint traditional Sherpa village of Dingboche with its exquisite views of Lhotse, Island Peak, and Ama Dablam. Day 08Dingboche to Lobuche (4910m.) Today, we walk along the lateral moraine of the Khumbu Glacier. We continue to climb as we are heading to the altitude of 4910 meters at Lobuche which is really just a few huts at the foot of giant Lobuche peak. Some breathing problems may arise today due to the altitude. Day 09Trek to Everest Base Camp (5365m.) then back to Gorak Shep (5180m.) This day also we walk along the Khumbu Glacier up to Everest Base Camp at 5365m. The view of the Khumbu Icefall from Base Camp is spectacular. Then we return back to Gorak shep for the night. Day 10Hike to Kala Patthar and back to Lobuche This will be one of the most difficult yet rewarding days of the trek. In the morning we climb Mt. Kalapatar, a small peak. From Kalapattar we can see the most magnificent mountain panorama of Everest, the highest point on the planet at 8848meters, towers directly ahead and other giants, Nuptse, Pumori, Chagatse, Lhotse and countless others. Then we return back to Lobuche. Day 11Lobuche to Chukkung From Lobuche we head eastward to Chukkung valley. Chhukhung (4730m.) valley lies directly under an incredible rock wall that links Nuptse with Lhotse. From here you will also have magnificent views of Amadablam (6856m. ), probably the most photographed mountain in Nepal. Day 12Chhukung to Island Base camp From Chhukung we walk along the Imja Khola to Pareshaya Gyab. Here we see the excellent views of the Lhotse Glacier and Nuptse-Lhotse wall. After walking some time from there we reach the base camp of the Island peak. Day 13Climb Island peak and return back to Base camp This day we climb the peak. From the Island peak we can observe and enjoy the amazing view of the white mountains of Everest region like Nuptse (7,879m. 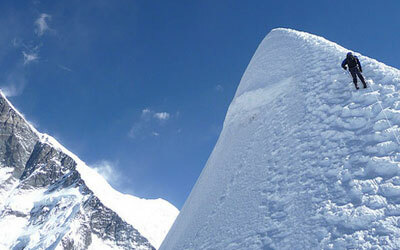 ), Lhotse (8,501m. ), Lhotse Middle Peak (8,410m.) and Lhotse Shar (8,383m.) in the north, Makalu (8475m. 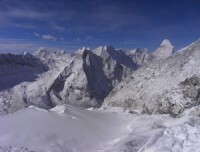 ), Ama Dablam etc. Then we descend down to the Base Camp where we stay overnight. Day 14Trek to Chhukung This day from the base camp we retrace our route to Chuukung. Day 15Chuukung to Namche Bazaar From Chhukung we at first we descend down steeply through the forest of rhododendron and pine. Then again we ascend to the Namche Bazaar. Day 16Namche to Lukla (2840 m) Finally we return to Lukla where the trek began, which will seem like a lifetime ago. Enjoying time to reflect on the trek as a group and the personal achievement of all those who took part. Also giving you time to explore the town. Overnight at guesthouse. Day 17Flight to Kathmandu This day you take flight back to Kathmandu. Day 18Leisure day in Kathmandu It's also spare day in case of bad weather in Lukla. Otherwise you can visit different places or do shopping. Day 19Departure. The trip ends, our Airport Representative will drop you to the Kathmandu International Airport for your flight departure from Nepal.